My eye! I'm not supposed to get finger in it! This week marked the 31st Golden Joystick Awards, and there were few points for guessing where the gongs were going. That said, there was still the odd surprise thrown in to keep us on our toes: Mark of the Ninja overtaking Hotline Miami for Best Indie Game was one we didn't see coming, and somehow Assassin's Creed III: Liberation beat away an incredibly tough lineup of 3DS titles to claim Best Handheld Game. But it was the revelation that the world is more excited about The Witcher 3: Wild Hunt than the PS4 and Xbox One that surprised us most. Of course, the game is coming to to PS4 and Xbox One, so unless you're planning to grab it on PC, you'll actually need one of those boxes to play it. Worth remembering. You can check out the full list of Golden Joystick winners right over here. Oh yeah, and GTA 5 won Game of the Year. We'll give you a minute to lift your jaws off the floor. How the hell do you top Mario Galaxy? It's a question we've been asking for six years now and we're still no closer to getting an answer. The next big Mario outing will be Super Mario 3D World, and while it's not shooting for the stars of Galaxy, it's beginning to look more and more appealing by the day. Nintendo pushed out two videos this week - an introductory piece and a video showing the first two levels from start to finish in co-op mode, which you can watch below. Gamescom 2012 might not have been one to set the world of gaming alight, but the reveal of Tearaway actually got us pretty excited about the future of the PS Vita. The game makes use of all the Vita's features, letting you interact via the camera, touchscreen, and the rear touch panel that's so far done little to prove it's more than a gimmick. Sony has now put out a new trailer to better showcase those mechanics. 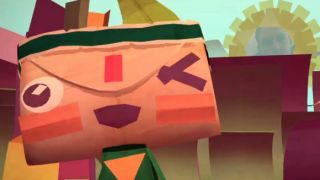 Out on November 22 - a month later than the original launch date - Tearaway is a much needed addition to the Vita lineup, in a year that's seen the 3DS go from strength to strength. Here's hoping the LittleBigPlanet team can deliver once again. We have an inkling that they might. The NES classic is 25 years old and we've put together our 25 things we still love about Super Mario Bros. 3 to celebrate. With Arkham Origins on the horizon, take a look a how far Batman has come over the years in our history of Batman games.